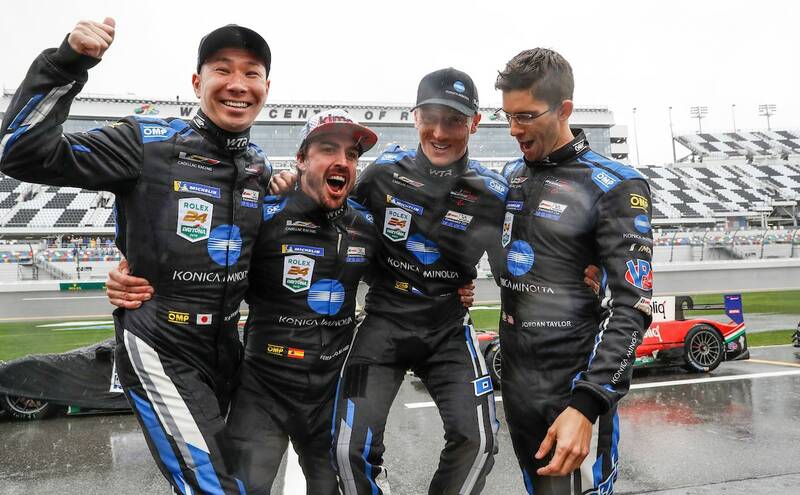 By now Y'all are aware of who won this year's Rolex 24, for which apparently is the first rain shortened race? Ending at 23hrs and 50mins, as Mother Nature intervened mightily! With not one, but two extended Red Flag periods totaling more than an eighth of the race's 24hrs duration. Whilst I previously asked Does Qualifying really matter? For which apparently not, since none of the respective Class Pole sitters won this year's event. Began my yearly tradition of watching Ye Rolex 24 race by tuning into the first three hours-plus on Peacock-lite, nee NBC Sports Network, (NBCSN) which made it funny they had the Peacock Pit Booth, Uhm Pit Box - in a not so subtle nod to Thar RASSCAR' coverage. But I wanted to Hear how the new NBC Sports trio of Leigh Diffey, Calvin Fish and A.J. Allmendinger sounded, as they were GURR-REAT! As Always, before I tuned out since I Don't Do the El Stupidio NBC Sports App; BARF! Especially since that's why I continue to pay for monthly Cable TV Service... Kapishe? As Messer Diffey playfully noted how his two expert analysts (Townsend) T-Bell' and the Dinger' (Allmendinger) were talkin' Smack over which of them would win another watch for this year's GTD category. With both getting considerable "Face-time" before driving their respective mounts. Although neither Bell's AIM Vasser Sullivan Racing Lexus or AJ's Meyer Shank Racing Acura won the class. Whilst it was good to hear Grand Marshall Scotty Scooter' Pruett Say his traditional Hi to My Family at Home Quip before giving the command to start engines! First Funny part for Mwah, was Marty "Snidely Whiplash" Snyder interviewing GM Executive Mark Reuss, who ironically talks 'bout Corvettes excellent Handling & Braking... Uhm Mark, aren't Yuhs the Dude who crashed a Corvette Pace Car at last year's Detroit Duelies' Indy Cars race? Then when Hurley Heywood was in the Peacock Pit Booth and asked 'bout Keys to the Race, he blurted out For Christ's Sakes, that's totally Inexcusable! After the two Corvettes had collided during their Pit-stop. IMSA Radio, which I listened to for some 14hrs; Aye Karumba! Lead announcer 'Der Heindenmeir', aka John Hindhaugh kept reducing the AAR Eagle MkIII's Mondo' horsepower figure! As "Ollie" Jarvis in his Mazda RT24P Daytona Prototype International (DPi) chassis finally broke P.J. Jones 26yr Track Record in Qualifying Thursday. Having first Quipped during Qualifying that it had over 1,200bhp; ZOINKS! Then on Saturday, saying 1100+ bhp, then 1000+ bhp. Which then became entertaining, as legendous' Sports Car Driver Derrick Bell joined him in Thar commentary booth. To which Derrick politely said I Don't think they had 1,000 horsepower. That's a Bloody lot 'O Horsepower! 300bhp's (more) is a lot of horsepower, claiming the Porsche's were pumping out 700bhp. As Bell is synonymous for driving Porsches, including the mighty 962C's he was quoting, along with mentioning how wonderful the Ferrari 333SP's V-12 sounded when driving for the late Gianpiero Moretti. Although I Don't recall Bell driving a Ferrari 333SP, I do recall him being Moretti's Hired Gunslinger for Thar Nissan GTPZXT - which was actually a Privateer Nissan NPT-90. Finally growing sleepy round 8PM, you're getting tired, very tired... I waited for the 8:35PM Pacific Hourly race report, which I never heard. With Johnny Palmer & Jeremy Shaw prattlin' on 'N on with sporadic class leaders. Which I only caught the following. DPi) #7-6: the two Penske Acura's. GT LM) #911-4-3: the Porsche leading the two Corvettes. GTD) #48-19: The Paul Miller Racing Lamborghini Huracan leading the MoreSpeed Audi R8. Then Shaw pronounced they'd just passed Lap 300, for which I jotted the following. L300 - 8:51PM #7-6-10-31-54 - as the top five contenders. Pit reporter Bruce Jones in his British accent mentioned Simon Pegan-noe', Bloody what? Then just prior to another round of Pit-stops, I caught the following car numbers leading each class. DPi) #31-7-6-10-54-85. LMP2) #18-81-38. GT LM) #62-66-4-912-3. And GTD) #86-14-29-48-11. As would any of these respective cars be leading in the morning when I awoke? Awoke Purdy' G-DAMN Early in order to resume listening to the race, for when I finally re-established Internetz' connectivity at 4:50AM - Dinger' was being interviewed w/Jamie Howe. As A.J. Allmendinger noted it was nice to have led again, as he's led laps for 14yrs running with Mike Shank. Howe asked A.J. which he put more effort into preparing for, racing or broadcasting? Definitely more effort on the Broadcasting. Noting how IMSA Radio's Shea Adam helped out with a pronunciation sheet on Driver's names. As the race was under a Red Flag for massive rain. As the CaddOh-lacc' Hourly update at 5AM revealed the following leaders, for which I hurridely typed the following Classes. DPi) #10-6-7-31 on lead lap. LMP2( #81-18-38. GT LM) #62-912-66-911-67-25 on lead lap. GTD) #86-29-540-63-88-11-57-12-14-73-48-33 All on lead lap. Then in a Harvenger of things to come, briefly going Green, the race immediately went back to another extended full course Yellow after the #9, No. 9, Number Nein! Faf Porsche 911 clouted the #46 Lamborghini Huracan - As Thar were definitely a Hurricane Ah-blowin! As the two collided in absolutely Abysmal conditions, as Drivers simply could NOT See where they were going due to the immense spray coming off the multiple Roostertails; YIKES! With the damaged cars getting stuck on the grass - tearing up the Daytona signage! Making it Fun for the tow trucks to get vehicles retrieved from the overly sodden grass. And while presumably 'Ol Fernando's soaking up the Champagne, Uhm Spotlight over pressuring Felipe Nasr into a tiny mistake. Which Alonso immediately pounced on for what would be the final pass for the lead. As ironically it would be three former Formula 1 Pilotes Duking it Out for Victory in the Wet, with Double F1 World Champion Alonso leading a Dejected Felipe Nasr home ahead of Alexander Rossi. As Nasr's now finished runner-up two years in-a-row. And I'm Not saying this is what happened, but part of me feels like IMSA Deliberately left the competitors out Thar, hoping that Alonso would somehow get past Nasr before they had to throw the Caution Flag... Although Townsend Bell mused when asked 'bout the conditions, that they all knew that Race Steward Beau Barfield's a Cowboy! As Tacoma Bureau Chief Mary Ellen noted when I told her my ambiguous feelings over Alonso winning; You've Never been Fond of Him. Since after all, he was Michael's (Schumacher) enemy I chimed in. Although I'd have been far more happy with either Nasr or Rossi winning instead, since they never got a real shot in Formula 1, albeit I'm happy for Kobayashi and Renger van der Zande - both notching their maiden Rolex 24 W', and Jordan Taylor to an extent, even if it DON'T Bloody Matter what a lowly Blogger thinks, Righto? Yet I was more impressed with Fernando's Overshadowed ex-Formula 1 team-mate "K-Squared," aka Kobayashi. As many hours before when Jamie Howe asked him after his Pit-stop and Driver change. How He felt 'bout being told persistently over the radio ZERO RISK if Montoya wants to pass you. Kobayashi nonchalantly said No Problem, there's a long time to go... As I mused to Thyself how Kobayashi is simply a Bad Arse Driver! And think he was also the #10's Fastest. The legendary Johnny O', aka Johnny O'Connell, who spent a Mega' 3hrs in the IMSA Radio Commentary Box, or as Hindhaugh quipped: "Triple Stinted." Finally relented and made a wisecrack 'bout if Thar was a Drinking Game for every time he said Cadillac, which he was doing Ad Nausea - being a Caddy' Ambassador. But it was quite Easy Listening, as Jonny's full of enjoyable & insightful information. Funniest part was his story 'bout meeting Alonso. Telling the Spaniard how they used to call his ex-Corvette Racing team-Mate Antonio Garcia the King of Spain. To which Fernando smiled broadly and said then I'm the Prince since I'm better looking and Younger; Botta-Boom... Which is partially why I've been calling him Fredrico Suave for years now; Hya! As Ryan Briscoe lamented how he'd been called in for a regular Pit-stop while leading in the No. 67 Ford Chip Ganassi Racing Ford GT. As they seemed en route to a third consecutive GT Le Mans class victory, until as Briscoe entered the Pits, the track went Full-course Yellow, forcing them to take Fuel Only as an emergency Pit-stop since the Pits were now Closed! And then one lap later the Red Flag was thrown for a second and final time. Meanwhile Herta's more esteemed BMW Driver El zorro', nee Alex Zanardi saw his hopes dashed when the car was dropped off its Hydraulic jacks before he'd successfully swapped steering wheels. Causing the electrical connections to be Damaged, ultimately requiring the Rahal Letterman Lanigan Racing crew to replace the entire Steering column! Whilst past IndyCar Driver S2', now primarily an Indy 500 Only specialist, Sebastian Saavedra was interviewed upon winning the LMP2 Class for DragonSpeed despite crashing in the Rain and Damaging the car.